Since advertising had become a mainstay of newspaper operation, it must be a subject of study by the thoroughly trained journalist. Learning how to sell space would be facilitated by a knowledge of how it was bought. The all-round newspaperman should master not only the physiology and anatomy, but also the psychology of the advertisement. He could shorten his route to that proficiency by a tour along “the other side of the sales counter.” An opportunity for such an experience led to my resignation from the St. Louis Globe-Democrat. Mermod & Jaccard, a leading jewelry firm, wanted a new advertising manager. 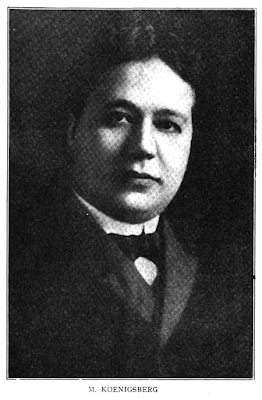 Harry B. Wandell, the city editor, was approached. He recommended me. Seven months in that position yielded a variegated crop of insights and understandings. Most important was the common disposition to reduce advertising to two denominators—cost and content. The need for research had found little or no recognition. The relationship between newspaper circulations and market prospects lay in the borderland of mystery. The nature and variations of reader responsiveness occupied an uncharted region. The average merchant believed the same judgments and tastes that guided the selection of wares should direct their presentation in public announcements. What better discrimination than his own could be used in the choice of media? On this he was intractable. The perspective afforded by my work for Mermod & Jaccard proved a manifold advantage in the publishing problems of later years. It quickened my understanding of the successive stages by which the traffic in linage assumed commanding importance in our national growth. Hit-or-miss adventures in space-buying gradually gave way to laboratory methods. Guides for manufacturing and merchandising were sought in surveys and analyses of the public’s needs and tastes. Markets were studied before they were flooded. Distribution took on the nature of a science. It required a motive power commensurate with its boundless range. It found that force in printer’s ink. The motor was supplied by the graphic arts. It actuated the system that established the world’s highest standard of living. By hitching mass production to the multiple outlets of an ever-expanding circle, by cutting from months to hours the span between output and consumption, by speeding the turnover of inventories, the costs of processing and fabrication were reduced to a minimum. The genius of advertising brought to America the abundant life. A spurt of enterprise by the St. Louis Chronicle facilitated my withdrawal from the marts of trade. The Chronicle had decided to make its local staff the strongest in the city. Among the moves in that direction was the creation of three new positions at the highest rate of reportorial salary yet paid in St. Louis—$32.50 weekly. That figure lured two stars—Walstein Root and Harry Tod—from the Post-Dispatch. It was less by $2.50 a week than my stipend from Mermod & Jaccard; but several times that difference would not have postponed my return to the news arena. The St. Louis Chronicle was a link in the Scripps-McRae—later the Scripps-Howard—chain of dailies. Organized by E. W. Scripps and Milton M. McRae, this string of publications won large success in the Middle West. Few managements equaled its efficiency in slenderizing expense. Frugality was imposed by requiring from each unit a net profit representing not less than 15 percent of its revenues. The spirit and methods of a Scripps-McRae plant found full expression in the price of the product—a penny. So, the St. Louis Chronicle’s salary splash was more than a local incident. Central ownership of a group of scattered newspapers presented challenging aspects. From my post on the St. Louis Chronicle, grave objections and difficulties became apparent. Remote control might be successfully applied to the counting room and its ramifications. Would distant direction work as well with the editorial department? Reserve resources available from other links in the chain did spell some security. But did they not also impose obligations and occasion distractions tending to dissipate local solidarity? A daily should give its undiluted all to its own readers. How could such service be maintained in the face of warrantable demands arising from exigencies or conflicting currents in other centers? Sacrifices were inevitable. How would they be guided— in behalf of a single link, or for the best interests of the chain as a whole? Could any community rely on the constant and unqualified loyalty of a newspaper under a non-resident ownership with stakes outside greatly exceeding those inside the district served by the publication? Few of these questions disturbed the St. Louis Chronicle staff. More immediate problems were always at hand. Some of them were futile embarrassments. These came in the main from capricious experiments undertaken “by order from general headquarters.” One was so inept as to halt even my irrepressible enthusiasm. It was a competition between the Scripps-McRae units. The mark of excellence would be awarded to the newspaper printing the largest number of items in a fixed period. To heighten the contest and also as a matter of general policy, the length of any single element was limited to 950 words. That, with a top head, would fill one column. By these rules, news fell under block instead of story appraisal. Each of the leading yarns of the day—a business sensation, an absorbing romance, a crime mystery, a social or political flurry— necessarily commanded the maximum type allowance. Each occupied a column. So, in respect to classification by space allotment, all were identical. Except for the order of their presentation—often a misleading index—they offered the reader no clue to their relative importance. Every page was crammed with as many items as the make-up men could squeeze in. Inconsequential trivialities—“corn-shuck scrapings too thin for a cow-lot weekly,” according to Harry Tod —were given the dignity of one-line headings. Nothing was overlooked to swell the tally in the contest score. The result was a newspaper of absurdly artificial values. The thought seized me that to remain on the St. Louis Chronicle would spell professional retrogression. Fear of being “caught in that kind of trap” restored Walstein Root and Harry Tod to the Post-Dispatch at their old salaries. John F. Magner, managing editor of the Star, welcomed me back to his staff. The St. Louis Chronicle itself followed the same course a few years later. It was taken over by the Star. Magner made no secret of his disposition to favor me. “So far as it will be practicable,” he announced, “you may pick your own assignments. I’ll arrange matters with Howard Littlefield, the city editor.” This singular partiality was not mistaken as a reward for merit. It was the expression of a secret gratitude. It harked back to my resignation from the Star eighteen months before, when George E. Garrett, city editor at that time, had instructed me to put a “murder slant” on a double tragedy resulting from a surgical blunder. The incident strengthened Magner’s executive hands. Through W. M. Laffan, the Sun installed a subsidiary, the Laffan News Bureau, for operating convenience. That bureau was my putative employer. My actual chief was Chester S. Lord, the Sun’s managing editor. It was my task to get all the usable Mississippi Valley items that could be gathered singlehanded. The extent of my success would be reckoned by the volume of material obtained from the St. Louis dailies. The two morning papers were members of the Associated Press. They were debarred by a rule of that organization from giving or selling to non-members the news they collected. The Associated Press asserted absolute ownership of this intelligence. That claim was the basis of a monopolistic program, opposition to which I undertook with keen zest. So, my new duties were spiced with the sense of a struggle against unrighteousness. Practical support came from various quarters for this fight against the theory that the rights of private property inhered in news. Ethical concepts of that dispute were in a state of flux. Its legal purports lacked authoritative definition for more than a quarter of a century. Then the United States Supreme Court divided on the subject. And the majority decision left unsettled an important phase of the issue. That ruling will be discussed in a later chapter. Resentment in reportorial circles against the Associated Press program grew with the development of its results. Economic reasons fed this feeling. Theretofore, the reporter had considered himself the employee of one publication. Now, he found he was working not for one newspaper, but for many newspapers—for every member of an association that stretched across the continent. And there had been no increase in his compensation. The dissatisfaction this provoked was aggravated by a sense of further injustice. The arrangement, by which the products of his labor were distributed among hundreds of publishers without benefit to him, included a constriction of his opportunities for additional earnings. Thenceforth, he was forbidden to sell to out-of-town dailies—no matter how far removed from competition with his own employer—the news he himself had gathered. It belonged to the Associated Press. Humorously exciting incidents attended my work for the New York Sun. A barter system was devised. Local stories—fruits of my own individual efforts—were swapped for telegraphic dispatches. My offerings were tendered openly. The items that came to me in exchange were usually delivered under a cloak of secrecy surcharged with comedy. Invariably they were brought to a rendezvous. Often the tryst was the back room of a saloon. The copyreader bringing me a proof or the reporter coming to whisper a tip frequently approached me with the exaggerated stealth of a villain in a melodrama. They were “on the lookout for Associated Press spies.” Their excessive precautions produced a picaresque atmosphere that they evidently enjoyed. It imparted to them a flavor of hazardous adventure. At the end of six months, this routine began to pall. The laughs were enjoyable, but they built no ladder to high success. It was commendable to serve a worthy cause; but it was much more desirable to have a major share in the service. No decisive results could be scored in the post that had been assigned to me. An abrupt divergence followed a telegram from Chester S. Lord. 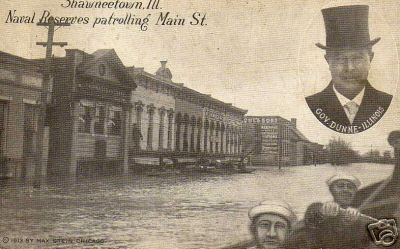 It was reported that a calamitous flood had wiped out Shawneetown, Ill., and several neighboring communities. Estimates of the dead ran as high as 15,000. “Please get there as quickly as possible,” Lord directed. This held the likelihood of the biggest out-of-town assignment yet intrusted to me. Newspaper circles were still stirred by recollections of the Johnstown (Pa.) cataclysm of eight years before. But the death list in that disaster had reached only 3,000. The possibilities for a reportorial exploit set me on edge. The main chance was to forward a complete report ahead of any other correspondent. Stimulating legends came to mind of various kindred feats. Outstanding was the hoary yarn about the journalist who commandeered a telegraph line. Only one operator with a single Morse channel was available. It was the telegrapher’s duty to complete the sending of a message before accepting any other dispatches. The hero of this incident wrote the address of his editor on the first page of a Bible and instructed the man at the key to transmit the contents of the volume. His own news copy was interpolated in instalments between Scriptural passages. Thus, until it became too late for his rivals to make use of it, he held the only wire leading from the scene of the story. With a slight variation, such a ruse might be repeated. Instead of a sacred work, a compact edition of Les Miserables found its way into my satchel. A much more practical provision was the assistance of an expert telegraph operator. Howard Deems, proud of his speed as a “press sender,” cheerfully accompanied me. Under thirty, wiry, spry and resourceful, he seemed especially fit for such emergencies as we might encounter. Shawneetown, on the Ohio River, on the far side of Illinois, lay less than 150 miles by a straight line southeast of St. Louis. Unfavorable railroad connections retarded us. Soggy roadbeds on the last leg of the trip doubled the delay. Twenty hours after our start, we reached the head of the floodwaters at Ridgway, Ill., eleven miles from Shawneetown. There, unable to proceed farther, more than a score of correspondents from Chicago, Detroit, Cleveland, Pittsburgh, Cincinnati, Louisville and other Midwestern cities were gathered in fretful frustration. Among them were several Associated Press men under the leadership of Harrison L. Beach. Our appearance was greeted with a round of supercilious snorts. “Johnnie-come-late for a handout,” sneered one of the offish crew. He was incensed over the fate that gave to tardy comers an even start from taw with earlier arrivals. Deems was feeling his oats. The sullenness of the trammeled journalists only raised his self-appraisal. With an air savoring of condescension, he announced that we represented the New York Sun. Apparently, Deems had hit upon a piece of news of the least possible interest to his hearers. A transition of glum faces into surly backs intensified the ambient boredom. But a single shout of welcome revived Deems’s spirit. A tall, good-looking chap came running to us. “I’m Dwight Allyn of the Chicago Inter-Ocean," he said. “It’s like finding comrades in an enemy country to see you. These fellows have been treating me as if I were a virulent case of smallpox.” The Chicago Inter-Ocean was a client of the Laffan News Bureau—anathema to loyal members of the Associated Press. So now we were three against the field. Allyn explained the impasse in which the news men were fuming. They had converged on Ridgway from different directions, all arriving shortly before sunset. For four hours they had been striving to obtain transportation to Shawneetown. Not a boat was left for use. The railroad was the only possible means of conveyance. Its sole functionary in position to act—the station master—refused to do so. He said his hands were tied. He had been forbidden to entrain any passengers for the inundated area. The track to Shawneetown was extremely unsafe. Acceptance of fares would involve responsibility for death or injury. The depot chief himself was anxious to explore the flooded section for missing kinsfolk. Wasn’t there somewhere at hand the key to just such a master stroke as had kindled my fancy at the outset of this assignment? Our Associated Press rivals had appealed to their headquarters for help. Railroad executives were being sought in Chicago to telegraph discretionary authority to the Ridgway station-master. Day might come before such orders were received. Wasn’t it possible to leave our confident competitors awaiting word from their superiors while we made our way to Shawneetown? The ban on transportation covered passenger service. It did not relate to freight. The depot boss would surely see this point if the cargo consisted of relief supplies. And, of course, the donors would be permitted to accompany the shipment at their own risk. A cash order for seventy-five dollars’ worth of groceries was a big event to Ridgway’s leading merchant. It became a larger matter when the goods were consigned to the stricken citizens of a neighboring community. It enlisted the diligent cooperation of the grocer and his assistant even though they were summoned from bed for the transaction. The relief train was made up of an engine, a caboose and a freight car. The provisions were loaded at a siding half a mile south of the Ridgway depot. Allyn and Deems waited with me under an abandoned water tower across the track. We pictured the restless vigil of our Associated Press friends pacing back and forth at the railroad station. Meanwhile, we watched for the locomotive fireman’s lantern signal that all was in readiness. When it came, at one o’clock in the morning, our glee was uncontrolled. This was a stunt we’d never forget. We made a headlong dash for the caboose. Inside were Harrison L. Beach and the entire aggregation of Associated Press men. At daybreak, Deems found a swaying telegraph pole atop a section of levee from which the floodwaters had receded. It supported a single strand of copper. Fifty feet away lay an overturned farm wagon. Deems set his sending key on the tailboard of the shattered vehicle and “hooked up a circuit” with a stretch of office wire that he carried. But Deems found little satisfaction in the deftness with which he worked. The bitterness of his disappointment persisted. It had not been allayed by Beach’s generous statements. My own discomfiture was considerably eased. The Shawneetown disaster had dwindled into relative unimportance. The death toll had shrunk from 15,000 to less than 50. So, consolation was gained by matching the measure of our defeat with the actual proportions of the story. Moreover, Beach had insisted on sharing the expense of the relief train. That was a tribute to the soundness of the undertaking. Perhaps my pique would give way to a consciousness of valuable lessons learned. This comforting reflection was interrupted by an oath from Deems. “Our wire is dead!” he complained. Again the mammoth rode the midget. The Associated Press crew had grounded the Laffan News Bureau line. Deems found the wire trouble in the person of Malachy (Mal) Doyle, a crack telegrapher, who had just arrived from St. Louis to reenforce our rivals. A strapping six-footer with a three-dimensional grin, his intentionally overdone show of innocence was a swaggering taunt. It said more derisively than words, “So what?” A compromise was proposed. Doyle would help Deems locate and repair the break, upon our agreement to share the channel with the Associated Press in alternate transmissions. Beach assented to the arrangement. Then came our inning. “You may have the first sending,” Beach was told. “The bulk of our story has already gone.” It was a small triumph, but it evened the score. The tally soon turned in my favor. Doyle had set up a loop direct into the Chicago office of the Associated Press. Messages were exchanged between Beach and his headquarters. Deems could not be excluded from the circuit. It was his chore to listen in. Scraps of historic news ticked from the instrument on the rear end of the battered wagon on the levee. Relations between the United States and Spain were near the breaking point. Deems handed me a transcript of a Washington dispatch that had just reached Beach. It recited the issuance of orders to all American consular agents in Cuba to join Consul General Fitzhugh Lee in Havana and be prepared for immediate departure. That could have but one meaning. We were on the verge of actual hostilities. The flood-drenched bottomlands of Illinois faded into a panorama of drabness. Beyond them stretched a vista of blazing battlefields. Nearly eight years had passed since my first ill-fated adventure in war correspondence. This time there would be no silly entanglements with Mexican filibusterers. This would be a man-sized job in all respects. Nothing should delay my start for the front. The Shawneetown story could be cleaned up by Allyn and Deems. My resignation as St. Louis correspondent of the Laffan News Bureau went by telegraph—over the same wire in which the Associated Press had forced a partnership and over which had come the Associated Press news that sped me toward the firing line.